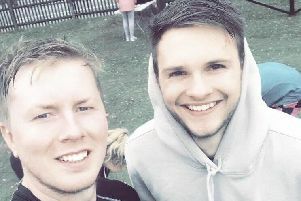 A man who lost a good friend to cancer has embarked on a gruelling challenge in his memory - running 10 half marathons in 10 months. Chris Dyson wanted to do something in memory of Andrew Jackson, who died from lung cancer at Cynthia Spencer Hospice last October. Mr Dyson, of Walthamstow, has been travelling across the country to run in different half marathons and so far, has raised more than £2,000 for the hospice. He will take part in the Northampton half marathon on September 9, his seventh run to date. Mr Dyson, 51, and Mr Jackson were friends for years, having lived together in London for a time. Mr Dyson said: "Andrew was just a generous, kind and considerate bloke. He was very intelligent but down to earth. "The hospice was brilliant when Andrew was there so that's why I decided to do this challenge. "I normally run every other day with my dog but I'd only really done six or seven miles. I'd been doing alright with the half marathons and I'd even achieved a personal best in Hull of one hour 40 minutes, but then the weather changed and I've been struggling with the heat. The last two have been difficult." Mr Jackson's partner Catherine Powell will cheer Mr Dyson on when he takes part in the Northampton run. She said: "We're all over the moon that Chris is doing this in Andrew's memory. We're hoping that lots of Andrew's family can be there on the day to support him in Northampton. What Chris is doing is fantastic." Mrs Powell, who lives in Abington, said that for a time after his diagnosis, Mr Jackson had carried on with life as normal and had made it to his oldest son's wedding in Scotland. He had also been to France to visit his dad in September. However, a chest infection soon after led to him being admitted to hospital and when he deteriorated, Mr Jackson was transferred to the hospice. He died a few days later, aged 55. Mr Jackson, a father-of-three to Sam, Georgie and Daniel, was HSBC's global head of legal for a number of years, working in Australia, Hong Kong and London. In 2007, he decided he wanted a change and a different pace of life. He spent a year in Malawi before relocating to Northampton, where his mum lives. It was then that he got together with Mrs Powell. She said Andrew's illness came to light after he collapsed one day. She said: "His heart rate just kept doubling and he kept having to go to casualty - sometimes he'd be going twice a day. This went on for about two months before he was diagnosed with lung cancer. "He never really spoke about it. He just got on with his life and he was really strong for his children. He'd had radiotherapy and chemotherapy and was doing okay, then it all happened quite suddenly." To make a donation to Mr Dyson's fundraising challenge visit https://www.justgiving.com/fundraising/chris-dyson67.